Held at Burlington, North Carolina on September 11-13. 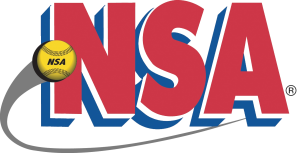 Team TPS posted a 4-0 record without a serious threat to win the NSA World Series (Sept. 11-13) at the Burlington, N.C., baseball park, and snap out a “tailspin” that had been lingering since the third weekend in June. Team TPS was the preseason No. 1, but had skidded to fourth in the Supreme Softball Top 25 rankings. Lighthouse/Worth jumped into the top spot by winning the first two legs of the Grand Slam championship series — the ISA and the ASA Super. But Lighthouse was a 38-17, 5-inning victim of Team TPS, then Team TPS was a 42-17, 5-inning winner over fifth-ranked Steele’s/R&D/Reda. Meanwhile, second-ranked Sunbelt/Dan Smith, playing without Todd Joerling and Dan Schuck who had been released by owner Wayne Williamson, was romping to three wins that saw 100 runs in just 10 innings — 32-0 over Allison’s, 34-9 over Xtreme/Hinson/Worth and 34-14 over third-ranked Sierra/TPS. Team TPS, which released J.C. Phelps, won 26-22 over Sunbelt in the winners bracket finals, holding a 10-run lead going into the top of the seventh. Jeff Wallace and Rusty Bumgardner each had two home runs, Dewayne Nevitt, Doug Kissane, Randell Boone and Mike Shenk one each. Boone’s was a 3-runner to cap a 5-run fourth and Shenk’s a grand slam to climax a 7-run fifth inning as Team TPS built up a 25-13 lead. 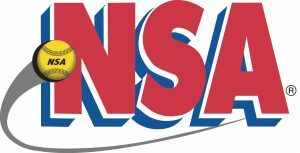 After Sunbelt scored 11 runs in the fourth inning en route to a 29-18 elimination of Steele’s, Team TPS socked Sunbelt 33-17 in the championship game, hitting four homers in an 11-run second inning. Team TPS had a 16-1 bulge going into the bottom of the third. Sunbelt pulled within 19-13, but drew a blank in the fifth and Team TPS iced it with 6 in the sixth and 6 in the seventh. Team TPS had 10 home runs. Todd Martin had two as he broke out of a slump with a 4-for-5 game. Shortstop Johnny Mello had two, plus a triple. Doug Roberson had two, including an inside-the-parker, plus two other hits. Kissane, Nevitt, Boone and Shenk each had one. Wallace, the MVP selection, had five hits, Bumgardner four. Kissane, Shenk and Brad Stiles also had triples. The field dimensions were 335-406-335. There were 326 home runs hit over the wall, 18 inside the park. That compares with 405 homers last year when Ritch’s-Superior/Tri-Gems/Beloli/TPS double-dipped Shen Valley/Taylor/TPS in the finals. Those two teams were merged for the 1998 season. The big yard led to a whopping 56 triples in the 22 games. Big Randy Kortokrax of Steele’s won the home run title with 13 in five games. He had 13 here last year too. The leader last year with Todd Joerling of Sunbelt with 16. Sunbelt’s Greg Harding had 12 homers this year, and teammates Jimmy and Tot Powers 10 each. Based on 20 at-bats, Sunbelt’s Jeff Hall led the batting average chart with .808. Brian Jeffers of Backstop/Easton went 13-for-15 for an .867 average. Team TPS had 49 homers in four games, Sunbelt 65 in six, Steele’s 58 in five and Lighthouse 56 in five. Sierra had 40 in four games. The Team TPS team batting average was .649, Sunbelt’s 636, Lighthouse .626 and Sierra .620. Brandon’s wound up in a tie for fifth, despite losing in the opening round to Lighthouse (25-8). Brandon’s won over Xtreme/Hinson/Worth 23-16 and Backstop 31-30 on a sac fly by Chris Graves before giving Steele’s a tussle before losing 50-29 when Steele’s scored 15 on 8 home runs in the fifth inning. Kortokrax went 7-for-7, with 6 HRs and 10 RBI for Steele’s. Steele’s totaled 20 HRs, Rod Hughes, Rob Schleede, Dennis Pierce, Dal Beggs and Jeff Ott two each. Amazingly, Steele’s drew 17 walks, including 9 in the second inning. That inning saw 19 straight balls. Brandon’s scored 13 runs in the top of the second, but Steele’s had 12 in the bottom half of the inning. Brandon’s had 10 runs in the fifth for a 28-22 lead. Eddie Foust was 4-for-4 with 2 homers, Mike Martin 5-for-5 and Chris Absher 4-for-5 with an inside the park homer. Slim Bryant had 2 homers, Graves, Chris Calcutt, Tracy Logan and Keith Roberts one each. Chase/Easton, winner of the ISA AA and ASA Major but 0-2 in the NSA AA, went 0-2 in this one, losing 27-26 in 8 innings to Herb’s/KCS/TPS, winner of the NSA AA, and 29-11 to Backstop. Herb’s lost to Steele’s 36-28, then won another 8-inning game, this one by 16-15 over Planet/New/TPS. Jeff Smith’s lone 2-run home run produced the winning runs vs. Chase and he got the winning hit vs. Planet. Rusty Hoke and Jon Meyers earlier homered in the 7-run top of the eighth vs. Chase. Smith earlier had a triple, homer and single. He also had two singles and a triple against Planet. Herb’s then was eliminated 26-2 by Lighthouse, and wound up in a tie for seventh with Backstop. Brandon’s 31-30 win over Backstop saw a 14-run fourth and a 12-run fifth after drawing blanks in the first two innings. Jerold Smith had a double, triple and homer, while Mike Martin had an inside the park homer. Eddie Foust had a 3-runner, Chris Calcutt a solo. Calcutt and Tracy Logan each had five hits, little Chris Beck and Slim Bryant four each. The winning run was set up by singles by Beck, Bryant and Calcutt. Sierra eliminated Lighthouse late Saturday night 42-38, regulating the LH crew to a tie for fifth place. Sierra scored 12 runs to seize a 42-32 lead in the top of the seventh. Pitcher Paul Drilling had a pair of 2-run homers. He also homered in the sixth and had two earlier singles. 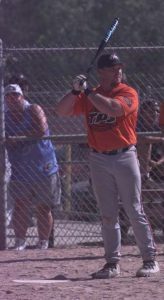 Darrell Beeler and Kerry Everett also homered in the seventh, while Jason Kendrick and Greg Cannedy each had two hits. Cannedy also had a hit in the 6-run sixth, and he wound up 6-for-6. Hank Garris, Larry Fredieu and Everett homered in the sixth. Everett had four in the game. Garris had two other 3-runners . . . for a total of 9 RBI. For Lighthouse, Scott Elliott had five hits, including 3 homers, Ricky Huggins had 3 homers and Dewayne Frizzell and Kirk Stafford two each. One of Frizzell’s was a grand slam. Dennis Mendoza had five hits and Carl Rose had a single, double, triple and homer. After the high-scoring wins, Steele’s was a 14-9 winner over Sierra in the first game on the final day’s slate. Sierra only two home runs — both by Beeler. Sierra managed only two runs over the last three innings. Garris was hitless in four trips to the plate. Steele’s socked five homers (Kortokrax, Hughes, Beggs, Ott and Keith Brockman). Rob Schleede contributed a triple as Steele’s made it 5-2 with a 4-run second. It was 7-4, 9-7 and 12-8 after the next three innings. Steele’s then was eliminated 29-18 by Sunbelt. Steele’s fell behind 21-9 when Sunbelt scored 11 runs in the fourth, then cut into the deficit with 8 runs in the top of the seventh. Sunbelt had six homers (two by Hall, one each by Harding, Hightower, Gilbert and McCraw) and three triples (by Dubose, Gilbert and Curtis Williams). Dubose was 4-for-4, plus a walk. Williams was 4-for-5. Kortokrax had three of Steele’s five HRs. Hughes and Ott also homered. Team TPS built up leads of 8-3, 18-11 and 25-13 in the first five innings in the 26-22 win over Sunbelt in the finals of the winners bracket. Sunbelt tried to rally with six in the top of the seventh. Team TPS had eight homers — by Bumgardner and Nevitt in the first, by Wallace in the second, by Kissane in the third, by Wallace and Boone (a 3-runner) in the fourth and by Shenk (a grand slam) in the fifth. Bumgardnder hit another homer in the sixth. Jimmy Powers and McCraw each had four hits in a losing effort. Powers had a homer, Harding, Hightower and Tot Powers two each. Sunbelt outhomered Team TPS 12-10, but was walloped 33-17 in the finale. Jimmy Powers had three, Hall, Harding, Hightower and McCraw two each. Tot Powers had one. Team TPS had five hits from Wallace, but no HRs. Martin had two homers among four hits, Bumgardner one among four hits. Doug Roberson also had four hits, including two homers, one an IP. Roberson totaled eight RBI. Johnny Mello had two homers, Kissane one (and a triple) and Nevitt, Boone and Shenk one each. Shenk, Mello and Stiles also tripled. Team TPS’ 5-inning run-rule 38-17 romp over Lighthouse saw the score by innings read like this: 7-8-8-6-9. Lighthouse was shocked . . . trailing 15-2, 23-3, 29-4 and 38-12. Wallace, Bumgardner and Shenk homered in the first. Boone had a long triple. Boone had a 3-run HR in the second. Mello also homered. Boone had another 3-runner in the third, and a 2-runner in the fourth. He was 4-for-4, plus a walk, for 9 RBI. Jobe, Roberson (twice), Kissane and Tom White, an added player from Wessel/Hague/SoJern/TPS, also homered. Wallace homered again. Wallace and Bumgardner each had five hits, Nevitt and Shenk four each. Wendell Rickard had three homers for Lighthouse, but he later had to sit out his team’s last three games with an elbow injury. Frizzell had three homers for the LH crew, Rose and Huggins two each. Lighthouse had five successive HRs in an 8-run third. Elliott, Davis and Stafford also homered. In fact, 14 of the 17 LH runs were home runs. The Team TPS 42-17, 4-inning romp over Steele’s saw a 16-run second and a 15-run fourth. Team TPS had 17 homers, including an IP. Kissane, who went 6-for-6, Nevitt and Boone each had three HRs. Mello had two, including a bases-loaded IP. Martin had a grand slam. Steele’s had a lot of HRs too — 10. One was an inside-the-parker by Ron Fields. David Hood had three, Lonnie Fox two. Sunbelt stunned Sierra with a 21-run, 10-HR third inning. McCraw had a slam and solo. Harding had two. J.Powers had two too, including a 3-runner. J.Powers, Harding, T.Powers and McCraw each wound up with three homers. Sunbelt had 16, including an IP by Harding. Hightower also had two HRs. On the other hand, the usually HR hitting Sierra club had only six. Garris had two of them. Howie Krause, an added player from Wessel/Hague, had six homers for Backstop, including three plus a double in the stunning 29-11 drubbing of Chase. Jeff Wallace NSA Super World MVP. Smythe Sox and Athletic Shop were declared Co-Champs in this rain-shortened event. Both teams suffered one loss. Smythe (had defeated Starpath in their first game) coming from losers bracket beat Athletic Shop in the first final 19-18 on 2 run homer by Bruce Meade. The “if” game was never played. Athletic Shop sent Smythe Sox to the losers bracket initially with a 24-15 victory. To reach the championship, Smythe beat Howards 45-12 in losers bracket final. Athletic Shop won a 7-0 forfeit over Superior Bombats in winners bracket final due to Superior having to catch their plane due to the long rain delays. Defending champ, Steele’s defeated Howards 37-12 in their opening game, were eliminated in back to back losses ; 29-28 to the Bombats and then to Howards 45-25. In the win over Howards, Smythe hit 21 HRs. Mike Parrott and Mark Heirlmeier hit 3 each, while Doug Brown was 5-5. Trailing 17-8, Athletic shop scored 10 in top of 7th to take a 18-17 lead. Larry Fredieu and Mark Lewis hit homers in that rally. Paul Drilling chipped in with a bases loaded double. In the bottom of the 7th, Cecil Whitehead got a base hit and then Meade hit his game winner. For Smythe in the game. Brown hit 3 HRs, while Meade, Parrott and Blake each hit 2. Blake was the tournament HR king with 14.
score. They scored 21 runs in the first inning. averaged 37 Runs per game. Steele’s also sent the Sweepers to the losers bracket earlier in the tournament by a 43-18 score. The Sweepers consisted of some Bell Corp and Starpath players. Due to the losers bracket taking so long, the Sweepers had to forfeit the final to Steele’s 7-0 to catch their planes home. Steele’s hit an amazing 96 HRs in the four games they played. Ritch’s/Superior defeated second ranked Starpath/LeAlCo of Kentucky twice en-route to capturing the NSA World Series. The Scores were 31-5 in the winner’s bracket final and then 29-19 in the championship game. Darrell Beeler was the MVP as he went 8-8 in those final two games. Their other two victories were against Williams/Fink 34-33 and St. Louis Softball Club 33-8. Legendary Craig Elliott came out of retirement to play with Datom-Argus. HE played with his brother Scott and they finished 3-2 in 5th place. were only 49 total home runs over the fence, plus 17 inside the park home runs. There were also 39 triples. Ritch’s beat Starpath in a come from behind 16-13 victory in the winners bracket final. Then after Starpath eliminated DJ’s, R-S beat them again in the Championship game 20-8. Defensive MVP – Todd Joerling, Bell Corp.
SS – Todd Joerling, Bell Corp.
Ritch’s/Superior went undefeated (4-0) to win its fourth straight NSA World Series as they defeated Shen Valley 28-24 in the Championship game. Ritch’s captured its fifth straight NSA World Series championship. The R-S Express from 1991-1995 has won 60 of the 87 tournaments the have entered and 15 of the last 24 Grand Slam events they entered as well. The NSA Super Class was disbanded. this never materialized into the NSA World Series as we knew it to be.